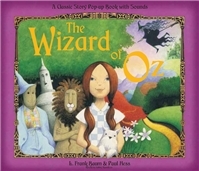 THE WIZARD OF OZ: A CLASSIC STORY POP-UP BOOK WITH SOUNDS by L. Frank Baum (retold by Libby Hamilton) and illustrated by Paul Hess is a very fun book that children are going to love. If the children in your life are anything like mine, then they are just drawn to pop up books. I guess it's the element of surprise that's slowly revealed as you turn the page. Oh wait -- maybe that's just the reason why I love pop up books. 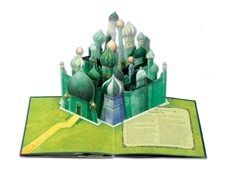 THE WIZARD OF OZ isn't your typical children's pop up book, though. This book has wonderful images from the classic story The Wizard of Oz as well as a brief retelling of the story, but it also has something more. THE WIZARD OF OZ pop up book also has sound! I think the sound effects of the tornado and the flying monkeys are terrific, but I also love the little song that is played when you open the page that features the Emerald City. The mix of pop up images and sounds is guaranteed to entertain kids of all ages. Silver Dolphin Books also offers a pop up book with sounds for the childhood classic PETER PAN. Either gift would make a fantastic addition to a young child's library. Thanks to the publisher for sending me a review copy of this book. Giveaway alert: The fine folks at Silver Dolphin Books have graciously offered to giveaway a copy of THE WIZARD OF OZ or any book on their site to one lucky Booking Mama reader. Head on over to their website and find a book for either yourself or someone you love, and then come back and fill out the form below before December 1st at 11:59 p.m. ET. I will randomly select and notify the winner the following day. Extra entries will be given if you follow Silver Dolphin Books on either Twitter and/or Facebook. The contest is open to those of you with U.S. addresses only. Good luck! That looks like such a fun book! The illustrations are gorgeous and I know kids would love the pop-ups and the sounds. What fun!! Makes me wish I had a little one. This one sounds like so much fun -- I think Ava would love it and now she's old enough not to destroy pop up books. A pop up book with sound?!? That's so cool!